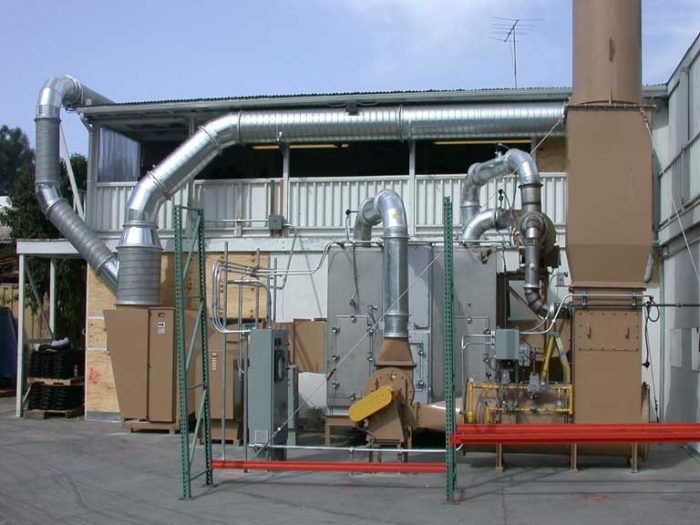 S&SE offers many different types of VOC abatement systems including Catalytic Oxidizers. VOC destruction occurs by chemical reaction, typically a catalytic oxidizer will achieve destruction efficiencies of 95%-96% and operate between 500°F to 800°F. Higher destruction efficiencies may be achieved by adding more catalyst and may also result in operational fuel saving of 40-60%. 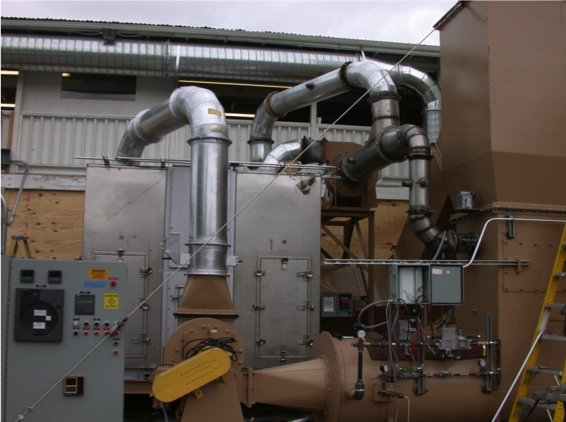 Catalytic oxidizers are supplied complete with Factory Mutual (FM) or IRI fuel pipe train, burner controls, control panel, and a process blower. When VOC concentration is low, often a heat exchanger is used in the exhaust (after the catalyst) to preheat the incoming process emission stream before it enters the burner chamber. Consisting of a chamber that is lined with an insulating ceramic fiber, a catalyst, and a burner depending upon the VOCs to be abated and the equipment design. The VOC-laden air passes through the oxidizer combustion chamber where it is heated before coming into contact with the catalyst, which oxidizes the VOC into carbon dioxide and water. Catalysts can be provided in pellet form or as a solid monolith. The catalyst may be a layer of precious metal(s) deposited on a ceramic, alumina, or metallic substrate. The base metal catalyst will cause oxidation of the VOC at an elevated temperature. If a pelletized catalyst is used, the pellets are arranged in basket type containers so that the VOC-laden air passes through the catalyst bed normally from the top down. A catalytic oxidizer is not appropriate for treating process emissions which contain metallic particles or other compounds that may coat the surface of the catalyst and prevent the VOC’s from chemically reacting (oxidizing). Certain compounds may “poison” the catalyst, coat or corrode the active catalyst sites, and permanently damage the catalyst. 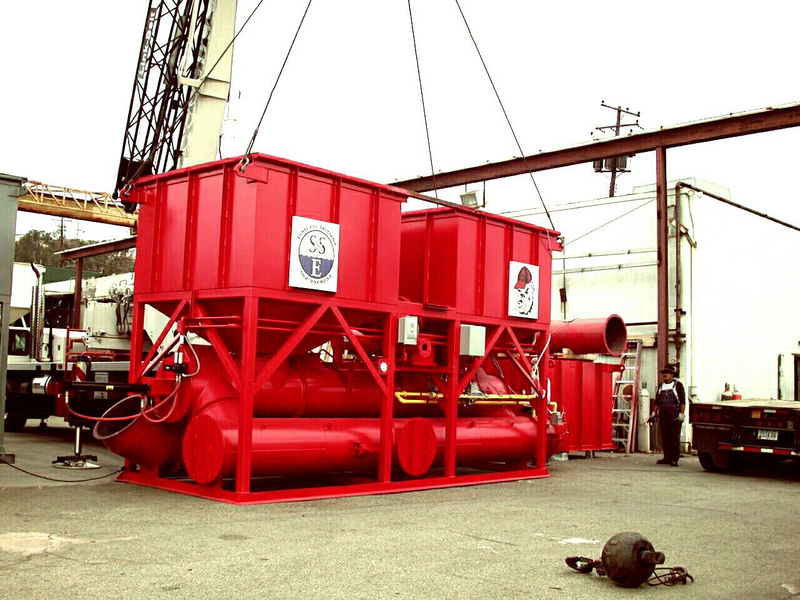 Ship & Shore Environmental specializes in evaluating the VOC abatement requirements and custom design of an abatement system that will meet your unique process requirements and air quality regulations. Let us gather the data and provide the information you need to make the best decision on any process upgrades, equipment selection and possible incentives that can add to the performance and profitability of your company.